The 2014 Alfred Dunhill Links Championship will be blessed with four of the Ryder Cup winners from Europe this week. Participating in this tournament will be Rory Mcilroy, Martin Kaymer, Victor Dubuisson and Stephen Gallacher. The man who captained them, Paul McGinley is also going to be participating. This is a packed tournament as it’s one of the richested on the European Tour. This was brought into the tour in 2001, and takes place over three separate links courses, which are St. Andrews, Carnoustie and Kingsbarns. This is a massive tournament and always a good one. Last year it resulted in a playoff between David Howell and Peter Uihlein which Howell won. Unfortunately he is currently battling a neck injury, and it’s unlikely he will be able to participate. This is a very tricky tournament to handicap, and we recommend betting half what you usually do. It’s amazing how random some of the finishes can be here. The 2nd favourite, but it’s sort of like the F1 racing where Hamilton and Rosberg tilt the odds. McIllroy participating and being at 4/1(just a ridiculous price in the post-Woods era), tilts the balance like crazy. 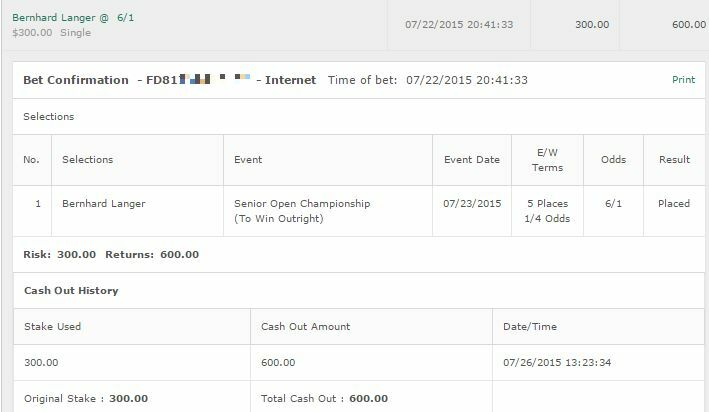 That makes Kaymer a fantastic pick at 14/1. He’s already won this tournament once before, and coming off the Ryder Cup win will be feeling confident. Kaymer hasn’t had the best season, but two wins this year – one being the U.S. Open, and his consistency on this course make him a worthwhile bet. 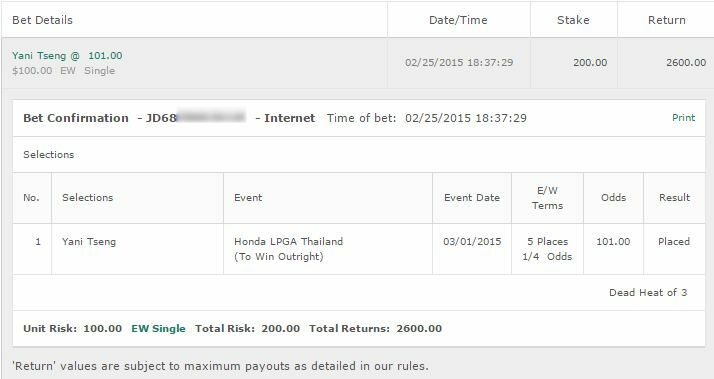 Bet: Martin Kaymer E/W. 14/1 at https://www.GTBets.com. Fleetwood has had a very mixed season, but this is a tournament he often does well at. He came 5th here last season and was consistent throughout the whole tournament. He cashed the year before, but after a great 1st round of 66 he shot in the 70s the rest of the tournament. But he was 5th again in 2011. He’s also coming off a great tied for 2nd place in the ISPS Handa Wales Open. He’s had a lot of cashes at the moment with 7 in a row. We think he has what it takes to be in the top 5, and at 25/1 we think it’s a great price worth taking. Bet: Fleetwood E/W. 25/1 at Bovada for Americans. 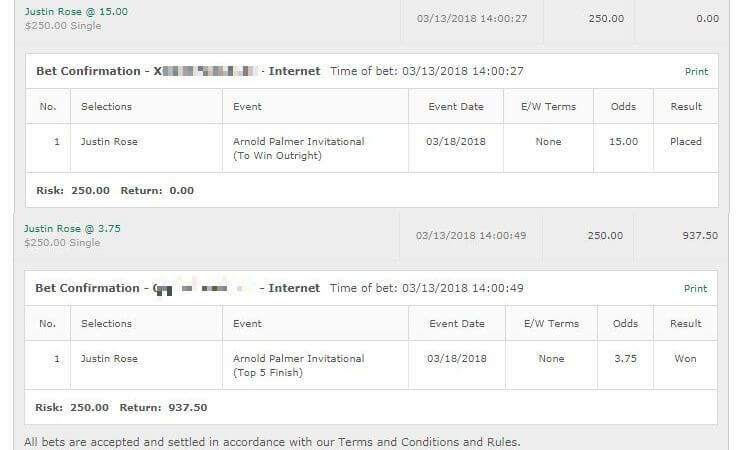 One of the most out there bets you will ever see us make. Gonzalez is a massive 125/1 here. Gonzalez has had a very, very poor year. His best finish was tied for 16th in the Aberdeen Open. At first glance, he doesn’t appear to be a contender at all. However when you look at his history at the links, you’ll see why he is worth a punt. In 2013, he finished tied for 7th. What’s noticeable is he did that with one spectacular round in particular – 67-69-63-70. He was only 3 off the leader. The year before he came tied for 13th. But he shot 71-72-63-69. Look at those first two. If he had just got under 70 on both of those, he goes from tied from 13rd to tied for 3rd. It’s one of those bets where we’d hate ourselves if we don’t make it. Bet: Gonzalez E/W. 125/1 at https://www.GTBets.com. The Links is always a tricky one – so boy are we feeling good after snagging a winner here. Gonzalez started well but couldn’t keep it up but really never had a chance. 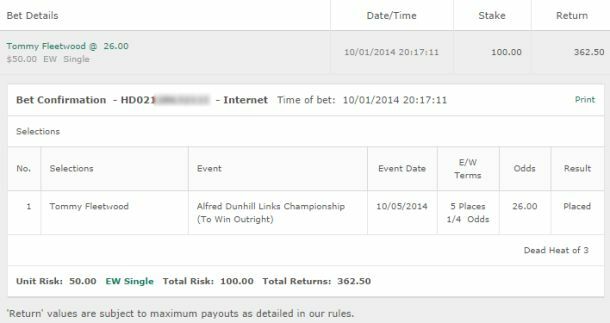 And Martin Kaymer was a huge disappointment, the 2nd favourite getting cut at the end of the 3rd round.